They are legends in their own time . . .
Men who are rightly called . . .
"The Three Kings of American Numismatics." He attended college at M.I.T. and graduated with a B.S. in 1932. In 1933 he won the Class A Squash Racket title at the YMHA, St. Louis. In 1935, he graduated with a J.D. from Washington University, St. Louis, Missouri, and that August passed the bar exam. 30th anniversary of retirement. And the best is yet to come! According to the above text published by the University of Rare Coins, on page 9 Eric is allegedly referred to as a "Living Ledged"
though we know him to be a "Living Legend in His Own Time"
Eric Newman has enjoyed one of the longest and most colorful numismatic careers in American history. giant of integrity Newman flat out told him, "No!" been collecting coins for a whole century now and didn't even start with a red cent, it was gray. Fig. 1. 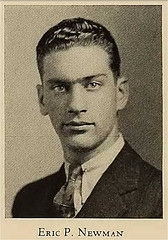 College Photo of 20-year-old Eric P. Newman while in his Junior year at M.I.T. in the 1931 Yearbook. Numismatic Society and is elected first Vice-President. Taylor, Chasnoff, and Wilson, Boatmen's Bank Building. Society. The announcement was published in the May issue of Numismatic Scrapbook. Robinson Green (1868-1936) coin collection. Missouri Historical Society, Jefferson Memorial, Forest Park. In June 1952 he was appointed the Assistant Secretary of the Missouri Historical Society. In 1962 he co-authored with Ken Bressett, The Fantastic 1804 Dollar. Fig. 10. The Fantastic 1804 Dollar. First Edition. In 1967, he published The Early Paper Money of America, which is now in its 5th edition, with a 6th edition forthcoming. Fig. 13. The Early Paper Money of America. First Edition. simultaneously also to another "How to pick a coin." Fig. 16. In 1976 he co-edited with Richard Doty, Studies on Money in Early America. In 1978, he was the recipient of the Archer H. Huntington Award from the American Numismatic Society. In 1986, he was inducted into the Hall of Fame of the American Numismatic Association. In 1991, he was awarded the medal of the Royal Numismatic Society. Medical Center, St. Louis, Missouri. In 1996, he was named "Numismatist of the Year" by the American Numismatic Association. "Newman Money Museum". The Museum has been opened to the public since 2006. In 2011, the American Numismatic Society commissioned and minted a medal with his portrait on the occasion of his centenary. The Life of Eric P. Newman. 75 years of writing and talking about them. Eric P. Newman, the Methuselah of American Numismatics passed away on Wednesday November 15, 2017 age 106 1/2 years old. From the Book Store . . .
St. Louis Dispatch, Friday, 7 April, 1933, page 52. St. Louis Dispatch, October 19, 1937, page 11.